Standard tank with customized top. Mankind has been collecting rainwater for thousands of years. But since the drought of 2011-2012, water conservation has grown exponentially. Concerns about water availability for gardening, landscaping, livestock, and even household use is significant. Gutterman specializes in small-scale tanks (100-1000 gallon,) placed under your downspouts for water collection. Rainwater is pure and contains no chlorine, calcium, or chemicals. It is ideal for livestock consumption and has the perfect PH balance for plants and gardens. If you are looking for a larger system for entire household use, we can help with that as well. We have installed gutters on hundreds of homes that incorporate collection systems for household use. Our knowledge and experience sets us apart. Gutterman offers two styles of small-scale tanks for non-potable use. Both styles come in various sizes and dimensions. We will determine the amount of water your roof or designated roof section will yield, and guide you in your tank selection. 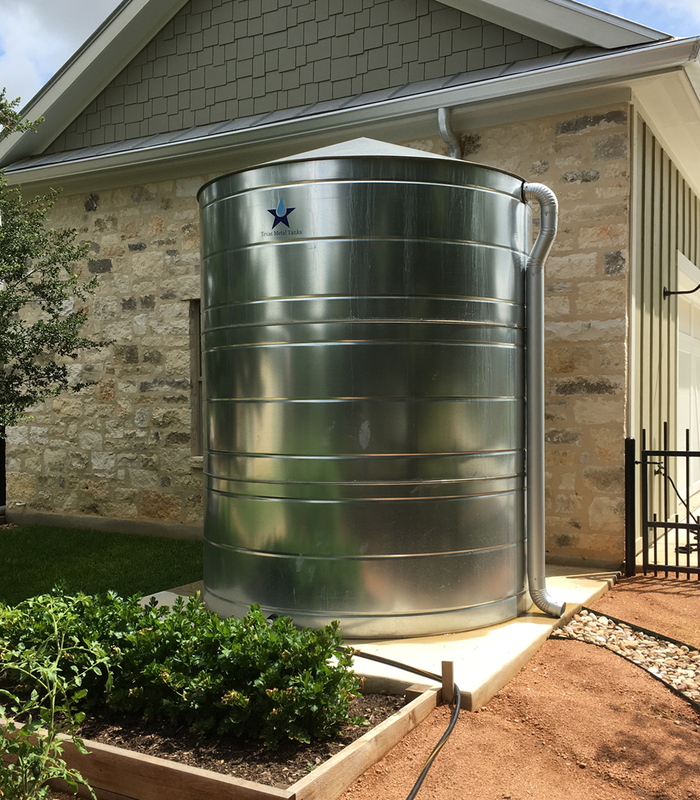 These “Old World” galvanized tanks are custom made in neighboring Dripping Springs. The beauty of the tanks are the tanks themselves. Therefore, many of our clients use them as a centerpiece, incorporated into the overall look of the house and landscaping. Texas Metal Tanks are available in various sizes. View tank options. Don’t get your tank from the hardware store! Do-it-yourself, generic tanks often lack necessary fittings and valves, and require modification to function well. Our Poly-Mart tanks are available in most gutter colors and a wide range of sizes. 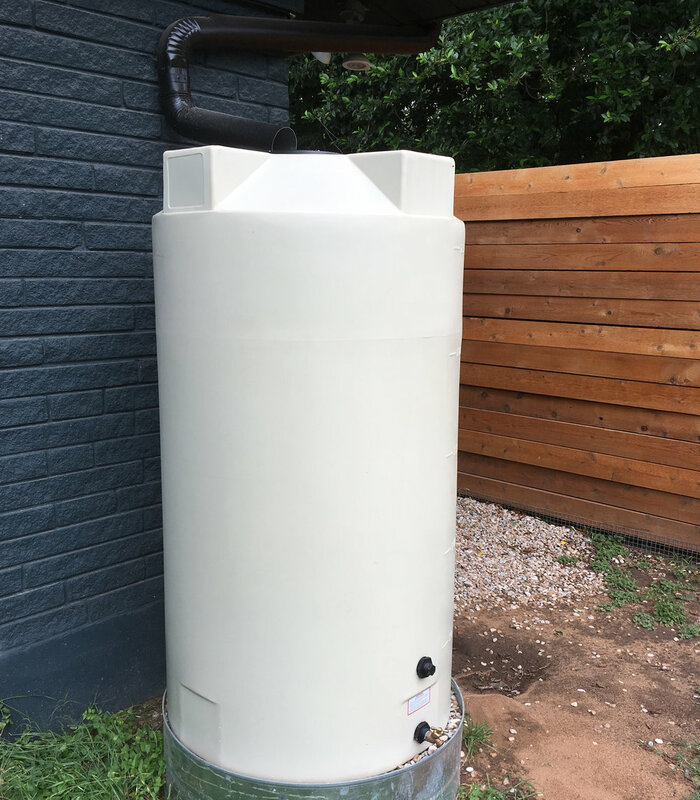 The best part is – they come assembled specifically for the proper collection of rainwater, equipped with Screened Inlets, Screened Overflow Fittings (no more mosquito problems,) Bucket High Fittings and Brass Water Hose Spigot. These tanks are turn-key and ready to collect! View tank options.